Electric heaters in rooms in winters. Tariff subject to 10% state tax and 5.15% service tax. No extra person allowed in Regular room. HPTDC offers various special discounts in season and off season. Following is the detail of discounts being offered. 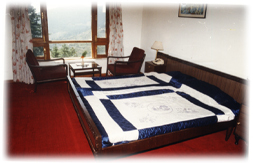 HPTDC offers 10% discount on room tariff in season at The Hatu, Narkanda. The discount is not available for a group booking but only on the room to be used by the elderly guest.